Our streamlined solutions give you the power to manage patient data and staff workflow throughout the cardiovascular cycle of care and offer you a single access point into advanced clinical applications, multimodality images, and reports. Holistic cardiovascular care begins with the heart but looks beyond the disease to understand what matters for all people at the center of care. We partner with you to make care informed, efficient and sustainable - bringing to life innovative solutions that deliver continuous, collaborative and personalized cardiovascular care across the health continuum. Contact us to learn how we can help you enhance patient care and improve productivity. IntelliSpace Cardiovascular is designed specifically with you in mind to help streamline clinical workflow and improve operational performance across your entire cardiovascular service line. 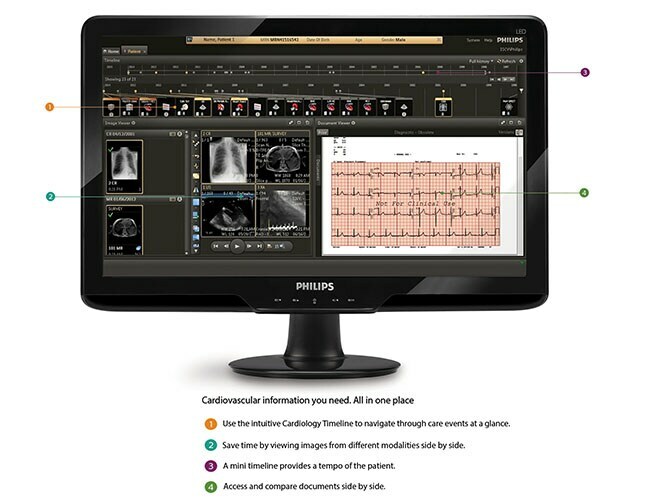 Explore an integrated cardiology ecosystem of data and devices working together to help you provide efficient and effective cardiac care in the most appropriate setting.